When the Herb was unfamiliar to the public 20 years ago in Korea, it is said she started to plant herbs in small green house in desolate land, this was registered as specialized Herb Plant Museum in Korea and became landmarks in Pocheon city(포천시), where is located in the northern of Seoul, a little far from around 2 hour drive from Seoul. 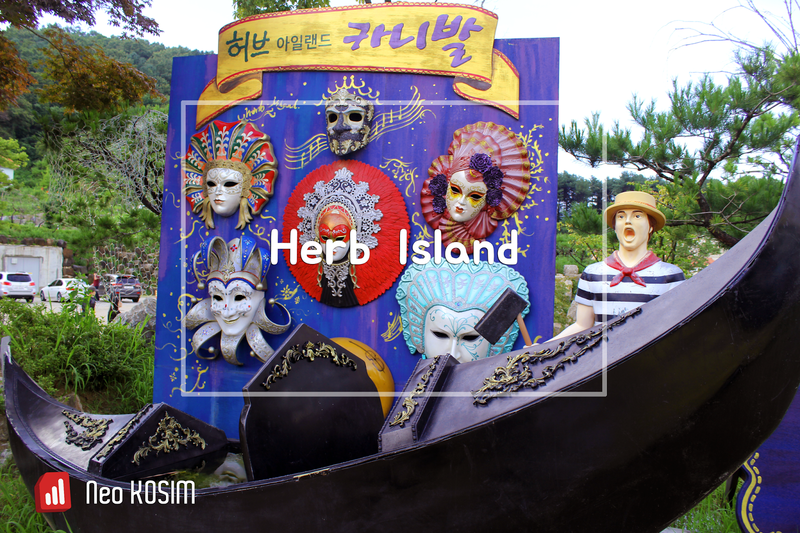 Herb Island, it's not a real island but just the name only. I used a tour bus that only goes on Saturdays. I didn't want to drive my car because the road of suburbs on weekend are always jam packed with lots of car. As I looked over the people waiting bus, more than half of them were young couples hand-in-hand. Aha, romantic date attractions? It has certain charming point that makes people visit here up to million visitors all the year. In the beginning, It is said, it reached just 10,000 square meters only in width and was barren land being overgrown with full of weeds and gravels. At that time there was no road, water and even electricity was not linked at all. They pulled up out the weeds, sow the seeds and planted the trees of Mediterranean herbs. But it was so difficult to get a success that there were several attempts and failures to fit it in the soil of Korea. Most of all, there is big difference in the amount of sunshine as compared with the one of Mediterranean. It is insufficient in Korea. The huge herb green house (Herb & Plants Museum) was considered to be the most valuable place of this place. It boasted several hundred type of herb and seemed like to show long cultivation history. I felt the green house is not only the simple cultivation area of trees but also each tree was treated with care. This herb plant museum has been played its’ role for as the matrix of this herb island absolutely, as I thought. The Santa Claus village, composed at the back side of these herb greenhouses, gave me another pleasure, too. How sweet and cool it was by the fresh flavor of herbal aroma in this hot summer! It was holding cooling event of aromatic herbal showering on the path during these hot summer days till end of August. Both Visitors and Santa Clauses lined on this path were soaked fully with foggy herbal vapor. It was very pleasant and something special aromatic experience. Summer Santa Clauses wearing in blue, small box houses decorated with items related on Santa Claus. People could feel the early Christmas mood on August and send their pre-card for Christmas at the tiny church on the hillside. With all of these in fairytale-like village, people were busy taking photos and enjoying early arrived Christmas day. The herb museum exhibits all about the herb in the side of food, flavoring, medicine and others. History of herb, herb related goods like oils, wines, liquors, vinegar and teas, making herb candles and soaps, handicraft corner, distillation corner of essential oil, many kinds of herb details helped my knowledge of it. What’s more, tiny items situated each corner added us aromatic pleasure, too. Recommend not to miss here. As time had gone so fast, we felt hungry. We enjoyed herb dishes in the Athens hall restaurant which is decorated in Greek style. How was the taste and price? The mood in there was very good but the price and taste didn't impress me enough. When the sun went down, this place became the more beautiful, stunning and romantic site than daytime with millions of starlike lights and gave me wonderful shooting time. The live show on weekend at square and to see the youth who boarded mini gondola circling this square made me happy even though I didn’t ride it. For a while I sat and took coffee break. Well, the two guys’ singing ability on the stage was not good enough. They had trouble hitting the high notes and some portion of notes was stretched more longer. I was eavesdropping on the next person said to funny when was passing me " What makes them sing just like crying?". Whatever it was, it didn't screw up my romantic feeling at all. Surely, the night has powerful strength to make everything looks beautiful. This light festival of night goes on all the year.Don’t wait to meet the beautiful night time in there. There were two accommodation zones on the back side, Herb healing center and experience building prepared various experiences like herb hydro therapy, herb & hay therapy, aromatherapy, tea therapy, stone therapy and others. Some rooms boast whirlpool bath in herb essential oil. It looked like have high grade and didn’t look cheap just to see it from a distance. 1. Shuttle bus run by DOOREBUS co.: Seoul city hall>Sport complex>Herb Island (running duration: 2hours). Night course is available only on Saturday. Day courses are available on Sat/Sunday. Send email to dooretourkorea@gmail.com for your booking. 2. Midweek:to Subway1 Soyosan st.#1>transfer to bus 57-1 across the street, not sure about the duration because the bus runs every 2 hours. May I know how to contact you? As me and my family would like to reserve Night course to the herb island on June. Thanks a lot to love my post. Do I have to make a reservation for the shuttle bus? Can I just buy the ticket on the day I want to go, of course on Saturday. By the way ,as I heard, it starts one hour early on Dec24,2016 due to heavy traffic jam in downtown of Seoul on Christmas season.best regards. I'm interested to book The shuttle to Herb island. Pls Advise how I shld contact you. Thanks. Dear Yvonne, you can contact them directly and be guided for the trip through their email. It's dooretourkorea@gmail.com . Take care.